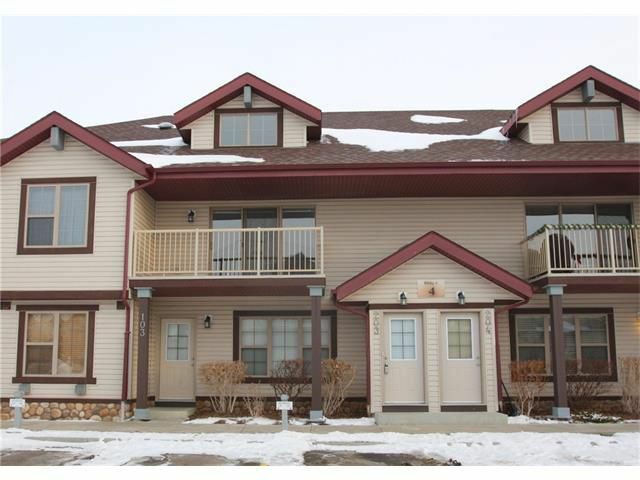 Well maintained top floor, 2-bedroom unit with soaring vaulted ceilings and an open concept floor plan. The kitchen features a center island, eating bar, & corner pantry. Dining room and the spacious great room has a storage area above the stairway & 2 storey windows for natural sunlight to shine through. Enjoy the south facing sun on your large balcony that can easily accommodate your petite patio set & bbq. Laundry is conveniently stacked allowing for additional storage. 2 bedrooms with ample closet space, 4 pc bath, & linen closet complete the interior. Utility bills are generally kept low due to the in floor radiant heat and tankless hot water heater. Parking stall (#183) is suitably located just steps from your front door! Visitor parking is also in great proximity to the unit. Within walking distance to Sobeys, Shoppers, Starbucks, restaurants, Fish Creek Park, and public transportation. Please note, prior to RECA's new measuring standards, this condo's registered size is 953 sqft.